What car is most hot in 2016!? Japan Automobile Dealers Association and Japan Mini Vehicle Association publish the sales ranking of automobile in 2016. Cars made by TOYOTA occupy the ranking first to third. 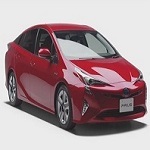 The first is "PRIUS" which is a core product of a hybrid car. This car still has popularity from 1997 with frequent model changes. The second is "AQUA(PRIUS C)" which is also hybrid car, and focus on 20s or 30s drivers. The thrid is "Sienta" which is mini MPV(multi purpose vehicle) with three interior layouts: seven or six or five-seater. In addition, this car has roundly body though standard mini MPV has a box shape body. The toal number of above three cars is over five hundered thousand, and account for 10% of the sales of automobile in 2016. The forth is "Honda Fit", the fifth is "NOTE" made by Nissan. Above four car are compact car, you know compact car is still popular in Japan. Except for compact car, "TOYOTA VOXY" whichi is MPV is the sixth in the ranking. VOXY has a box shape body and a high ceiling. This car is popular for young people and young family. In addition, "Honda Vezel" which is SUV is the eightth in the ranking. Vezel is a comfortable size for city life and has a mobility. This car is the first in the SUV sales ranking 2014 and 2015. What car will be hit in 2017?